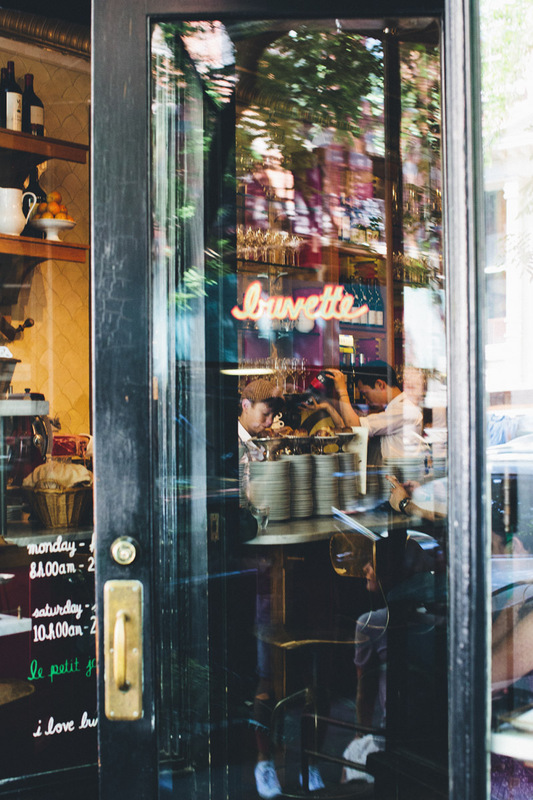 A few months ago we got to spend the weekend in New York, on the way back from the Saveur Food Blog Awards. Since our time was limited we had (for once) prepared well, with a list on several places that we wanted to visit. It turned out to be such a nice little trip. We came home with holes in our shoes, our bellies full of delicious food, two vintage muffin tins and a breakfast recipe. We had brunch at Peels one of the days, and it was there that we tried a delicious soaked oats recipe. In many ways, it was quite similar to the one we normally make at home. 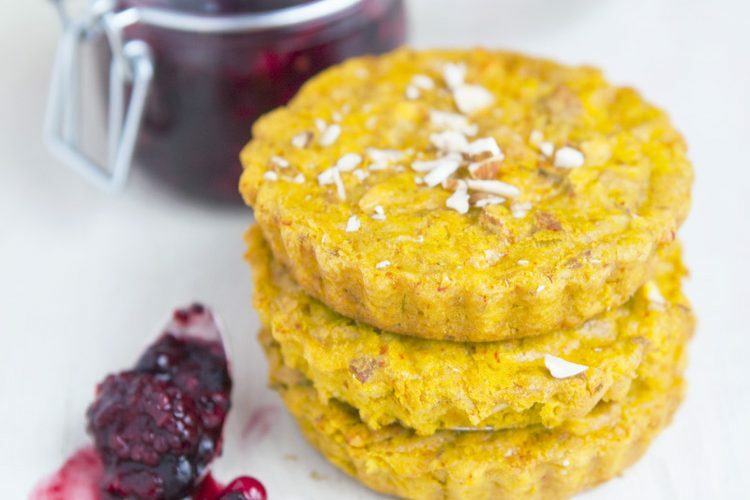 But their oats were soaked in orange juice – so brilliant! It gave everything a very fruity and fresh tone. Since then, we have totally adapted/stolen their recipe and made it into our own. 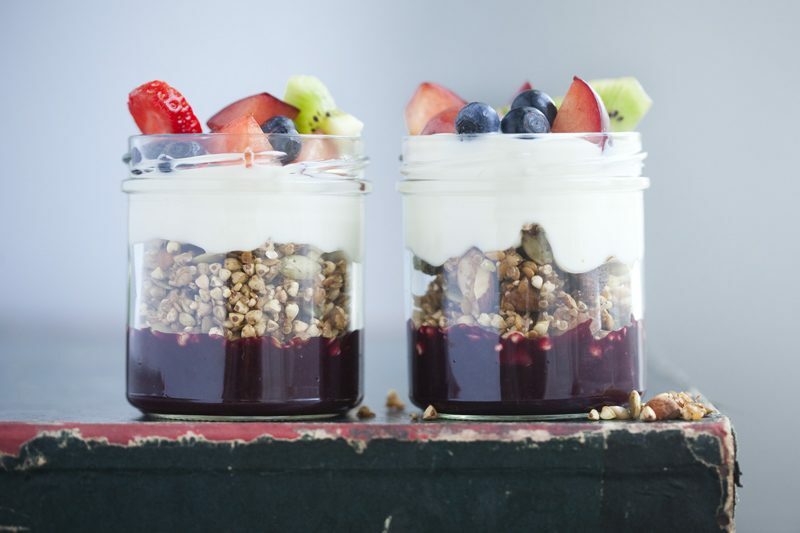 We serve this breakfast in layers, with soaked seeds in the bottom of the glass, oats in the middle and roasted coconut flakes and fruit at the top. 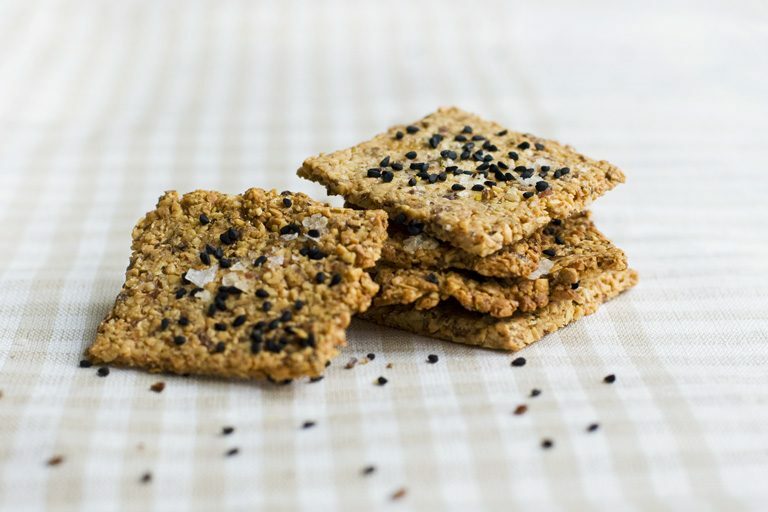 If you like our Raw Buckwheat Porridge, we are certain you will love this as well. We have shared the recipe at the bottom of this post. 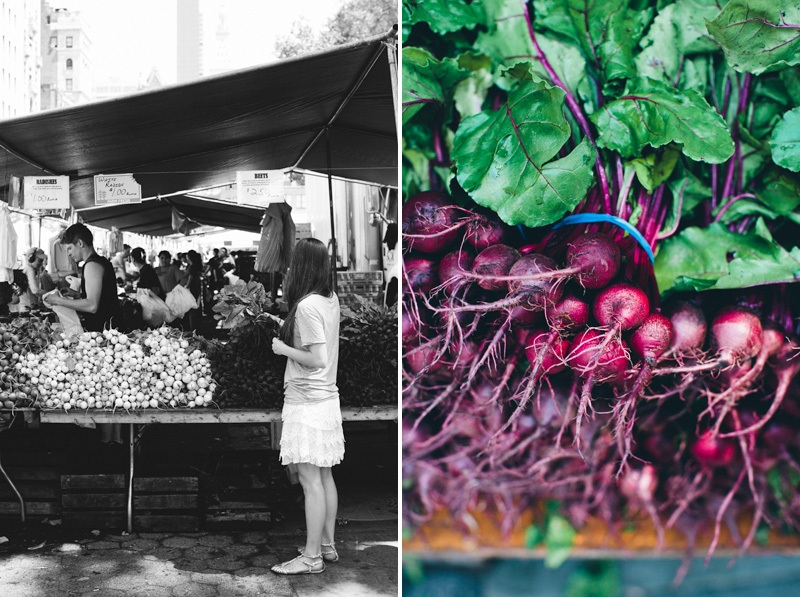 But first, some snippets from NYC. 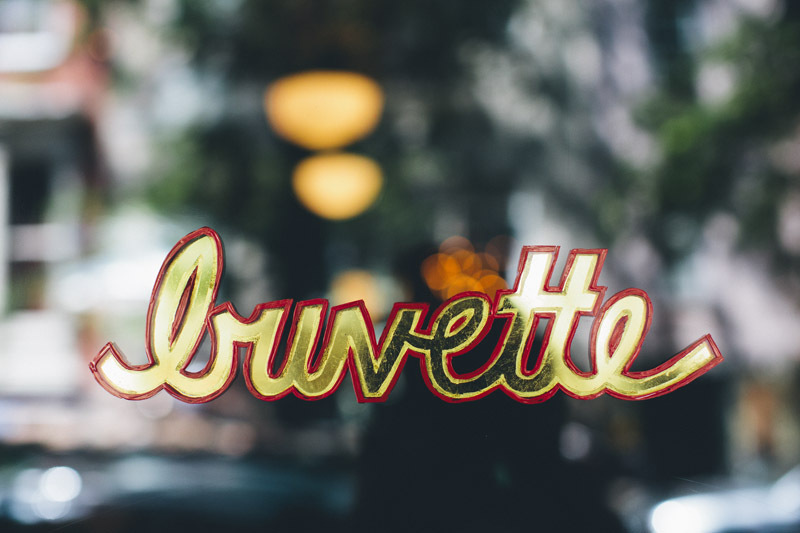 Buvette. Great food (a tad on the heavy side), a beautiful space and a lovely atmosphere. The Butcher’s Daughter. Such a funny name on a juice bar. 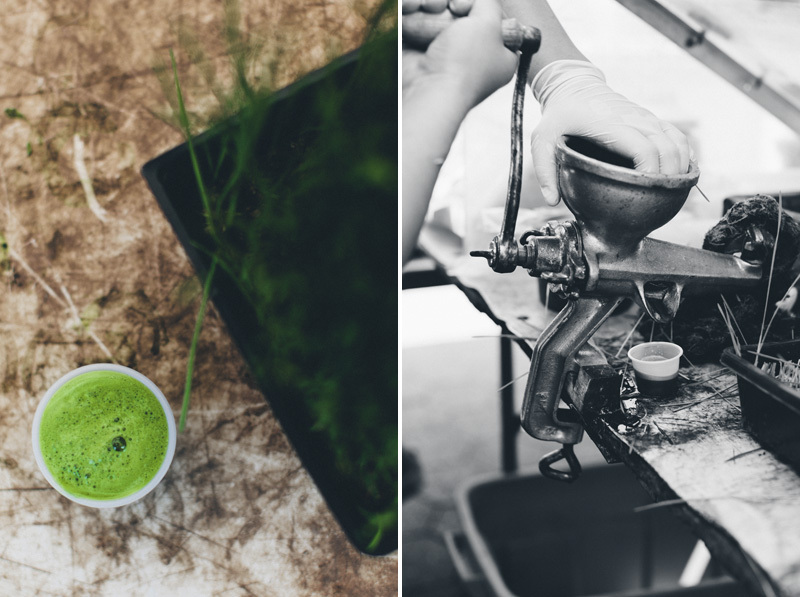 They had super delicious and fresh juices, smoothies and salads. We only went there for lunch, but they seem to have pretty awesome dinners as well. All vegetarian & non-dairy. 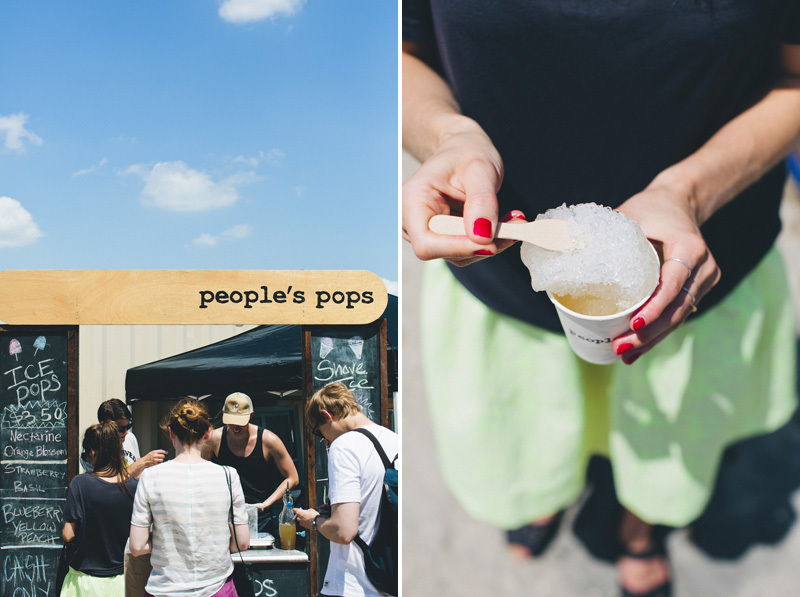 People’s pops on Williamsburg Flea. That guy in the cap shaves the ice by hand, scoops it over to a cup and tops it with different syrups. Very high coolness factor on that! We suddenly felt the urge to own a big ice block and an ice shaver (or whatever it is called). 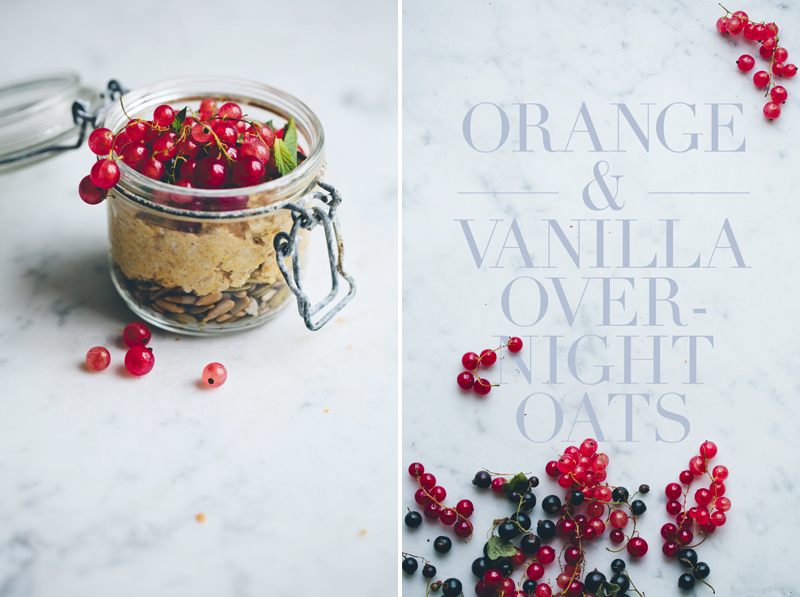 In the evening: Mix oats and vanilla in a bowl, add freshly squeezed orange juice and stir to combine. Place seeds in a bowl and cover with water. Place both bowls in the fridge overnight. 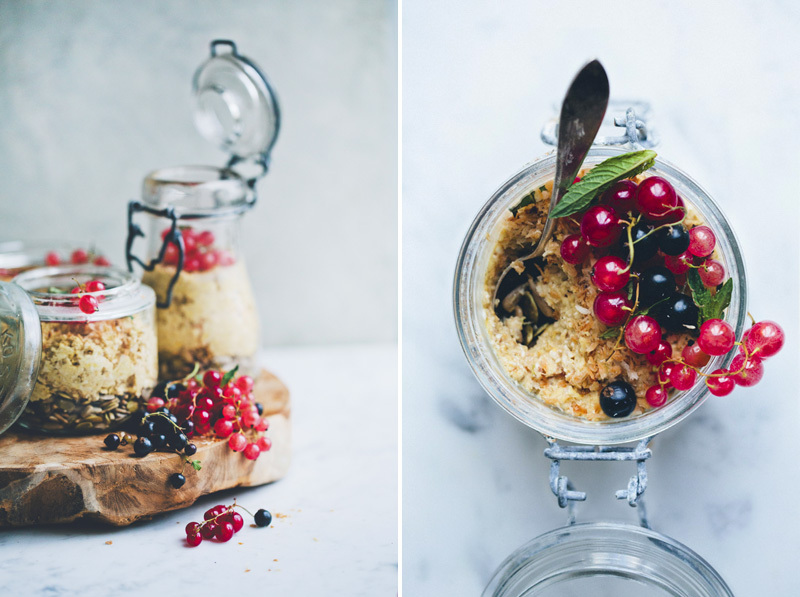 In the morning: Scoop a couple of spoonfuls of soaked seeds in 4 jars or glasses. Scoop the soaked oats porridge on top of the seeds and cover with fresh fruit and lightly toasted coconut. Keeps for 3-5 days in the fridge. I normally soak my oats in coconut or almond milk but when I was at my parents house in Italy recently there was a jug of fresh-squeezed blood orange juice so I used that. The result was absolutely gorgeous, especially mixed with a little greek yoghurt, so I can imagine this is wonderful too. Beautiful photos, as always. So beautiful - love the photos of NYC and the oats are just out of this world stunning. Since I've been traveling, my go-to breakfast has been cooked oats made with a water + currant juice combination - but I'm growing tired of it and will have to get my hands on some orange juice to give the overnight variety a go. I adore oats, I haven't tried to soak them through. Will have to give the oats and orange juice bath next time. What a superb idea to soak oats in orange juice, I bet it must taste deliciously sweet with a tang! 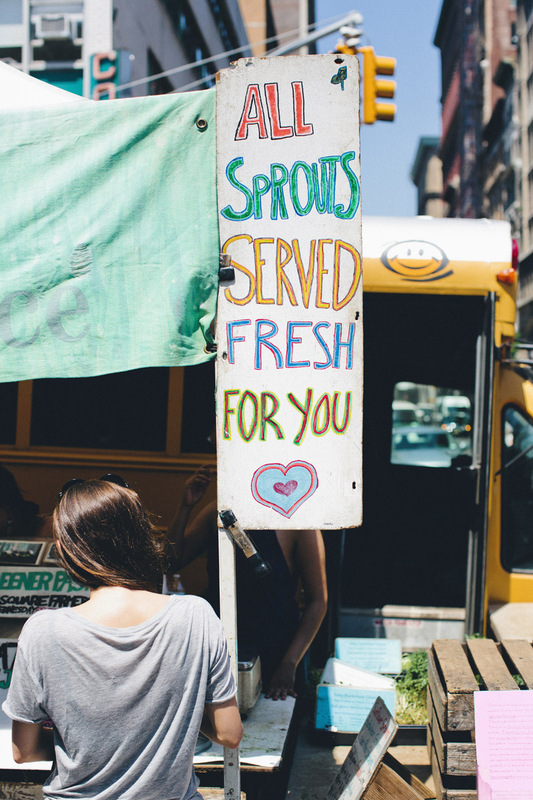 Thank you for sharing another inspiring recipe and your great photos of NYC. We were just there 2 weekends ago and took both kids sight-seeing around town for the first time for them, of course they both loved it and were dazzled by all the new discoveries in the big city. 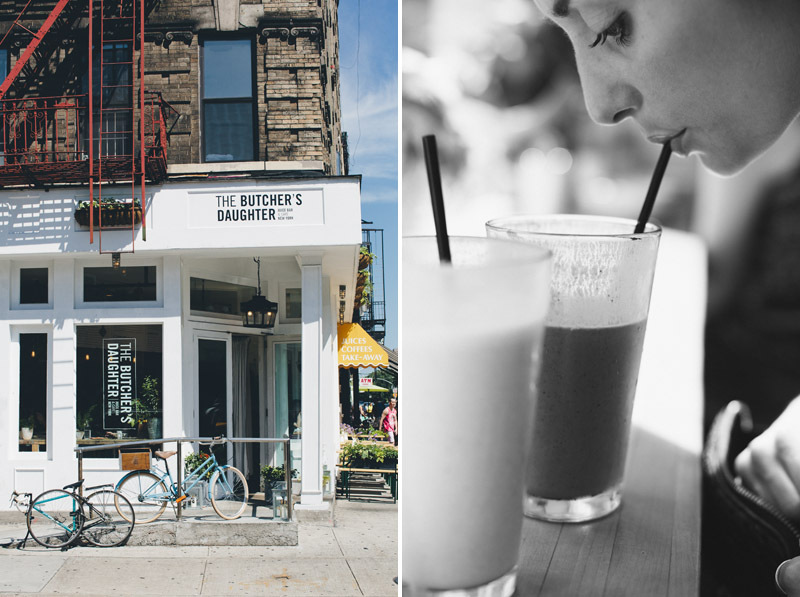 We'll have to check out the Butcher's Daughter Juice Bar & Café next time we go up there, their menu looks enticing. Just gorgeous!! !Thankyou so much for sharing such special snippets! You guys must be so busy!!! your cookbook came through the post yesterday and ive mounted it almost like a sacred text up high in my kitchen hehehe its totally amazing. Thankyou always for the inspiration! ps you must come to Australia!!!! Yum! Both the photos of New York and the recipe. I love holidays where you come back with recipes as permanent reminders (which you can recreate at home!). 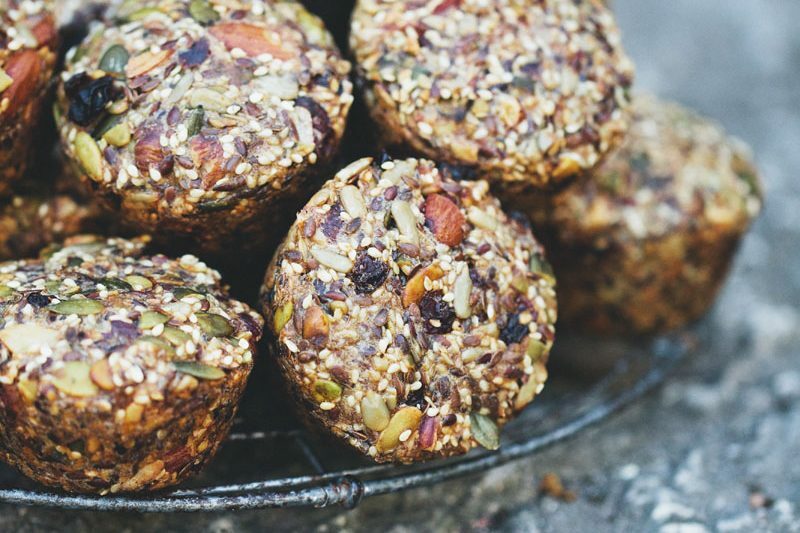 These oats look delicious! I love oats, but have never thought of soaking them in orange juice! Sounds like a great summer breakfast. I passed by the Butcher's Daughter in NYC but it was unfortunately closed! Will definitely try to pop in the next time I'm there. I pinned this recipe and can't wait to make it! NYC is my hometown, so it's nice to see familiar images since I moved two years ago and now live in Colorado (which is really one of the best thing I've ever done :) Next time I visit my folks, i'll be sure to stop at The Butcher's Daughter! Looks like you had a lovely trip! The oats are a wonderful idea. What a fun recipe! I was at that flea market a few weeks ago...what a great place. 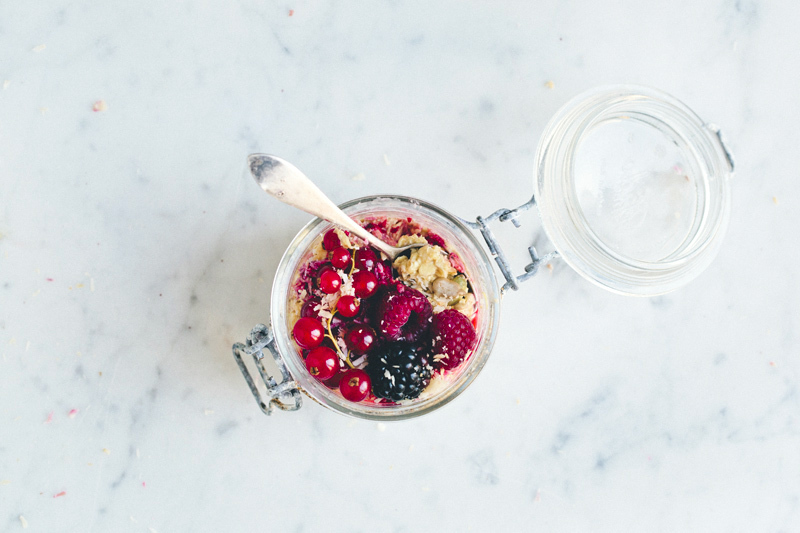 Overnight oats make me seriously happy, and this recipe is lovely!! This looks so beautiful, though I always use almond in lieu of vanilla. If only I can get my boyfriend to eat oats? We always soak ours in apple juice, no water, and then add a little yoghurt and fruit. I will give your recipe a try, sounds delicious of course! I can even see my old window in the picture that says "Sprouts here". Awww. I gather this is served cold? Are the seeds raw and that's why you soaked them? Thank you...can't wait to try! I used to live above the Union Square Market. Nothing better! 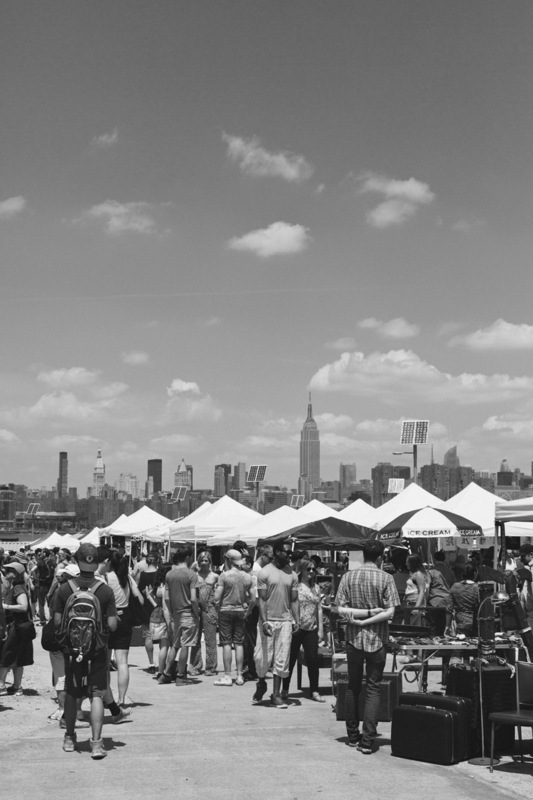 And the Williamsburg Flea! I miss NYC so much! Thanks for helping the memories flood back in. Love the raw oatmeal. Can't wait to try your version! This looks fantastic. I love the idea of OJ. Just tried mine with a 50/50 blend of almond and coconut milk, which was fantastic. Also, I always add a couple of pinches of sea salt. It makes the flavors shine like you wouldn't believe. I often make soaked oats but have never thought about using orange juice. Will try for sure. Wonderful photos from NYC! I have never been there but if I go I feel like I must try butchers daughter! Yum. @emily: Orange juice is commonly used with this type of recipe, even orange peels can be used! Have a nice day!